I'm having real trouble with the QuickAppend method of the Chilkat Zip module. Every time I use it, I seem to end up with corrupted zips. I have tried this using both NodeJs and Python versions of the Chilkat zip extension. I'm not sure if there's something I'm missing! You're likely using an old version of Chilkat. I recall this problem being fixed. Test with the latest version..
Are there later versions that I should be trying? I noticed that cknotes.com lists version v9.5.0.57, but I couldn't see this available for download on the main chilkatsoft.com site. I realise that v9.5.0.57 is just for Ruby; and so I'm pretty sure I'm already on the latest version for both Python and NodeJs. I'm certain I'm using the latest version of the software. Is there anything else I can try? Is it possible that it's a bug? I'm pretty sure my code is inline with the examples. I'll see if I can reproduce the problem.. I tested exactly the same as what you have, but did not encounter any problems. Check to see if both .zip archives are valid, prior to running your test. Maybe you're starting with invalid .zip archives to begin with..
PS> Chilkat will catch up to the latest version of Node.js ASAP.. Thanks for the reply. This is really strange. I used CodeAnywhere's Linux containers to do these tests. I tried containers with both Centos 6.5 and Ubuntu 14.04. These are standalone / out-of-the-box Linux servers. Here's how I created the zips (on the command line). mkdir zip1/ cd zip1/ touch testfile.txt zip -r zip1.zip . I verified that this zip was okay by unzipping it on the command line, and all uncompressed without issue. So I don't think these are corrupt. I also tried creating zips using another Chilkat example, which worked correctly to create the zips. But when I do the QuickAppend, I find that the zip becomes corrupt. If I append zip2 into an existing zip1, then when I uncompress the newly appended file (zip1.zip), I seem to only get the zip2 files, and don't see the original zip1 files any longer --- and I get the "77 extra bytes at beginning or within zipfile" error. So it's as if it's added the new content, but somehow overwritten the file list or done something incorrectly at that point? Is there anything else I can do to test? I'm using CodeAnywhere because it's an out-of-the-box system, and am trying on two different Linux OS's. I guess I could try on separate Windows or Mac systems too if it would help. I could also try creating the zips in a different way, if it could be an issue with the built-in Linux zip utility. So the existence of extra bytes may not be an error technically. I'll run a simple test to examine the resulting .zip created by QuickAppend to see if I can spot the extra bytes, and if found, try to understand why it exists or what it is.. Thanks for this. Yes; that would be great! Meanwhile, I have tried creating zips natively on my Mac, and then running the QuickAppend script on these. When I try to extract the resulting zip on my Mac, I get a "fatal error" when extracting the zip; so I think it's something that doesn't just affect the command line zip utility. It turns out that the Mac does uncompress the zip, even though it gives a fatal error. But the uncompress zip only has the content of the file that was merged into the zip, and doesn't show the original zip (eg. the same thing I saw on the command line). 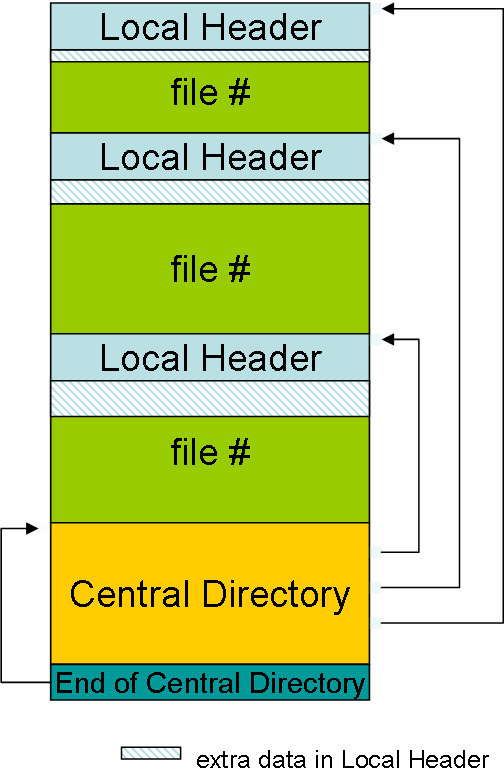 Great, I'll have a look more at the structure of zips and see if there's anything else I can spot about the central directory, etc. I'm going to try on a PC as well, just so that I've tested that too. And one of my colleagues is going to try the same thing on the C# version, just in case it's something that only affects Python / NodeJs. I also noticed that the filesize of the newly merged zip, is more than twice these size of the two original zips; which seems weird! I hope this is helpful; thanks for the info so far.